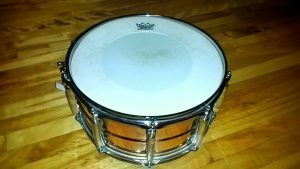 Top 9 Old Drumhead Uses: Don’t Just Throw Them Away! 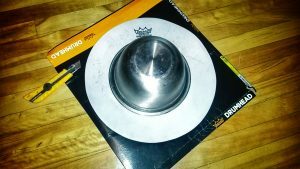 Wondering “what can I do with my old drumheads”? there’s a bunch of great uses for them! Turn that old drumhead upside-down and lay it on one of your drums… It will give you a super thick and low thud (ballad rock style). This is great on a snare drum for a really deep and fat sound. Overtones and sustain will be non-existent, and the fundamental pitch of the drum will be lowered. Tip: If you’ve got a thicker or 2-ply drumhead, the effect will be more dramatic than with a thinner or 1-ply head. 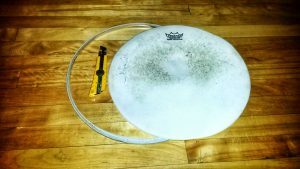 Turn your old drumhead into an O-Ring or Big Fat Snare Drum type ring, which will cut overtones and give your drums a fatter, deeper sound. This is one of the most useful things to do with your old heads, and they’ll last (almost) forever if you do it right. Tip: If you’re cutting up a 2-ply drumhead, you can end up with two o-rings (since there are two layers of film making up the head). 2-ply drumheads with control rings are sometimes stuck together around the outside, so you may need to cut inside the control ring. Also beware if you’re cutting an Evans Hydraulic drumhead – these have a thin layer of oil between the two plies. 1) Keep it like that (go test it out on a drum now!). This will give you a really deep, fat thud, which can be great on snare drums. Step 2: Cut a smaller circle out of the center of the drumhead. 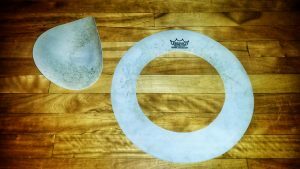 Find a round template (use a bowl, a small cymbal, or a smaller drumhead hoop). For a deeper and fatter sound with minimal overtones, create a thick o-ring by cutting a small hole. To keep more of your regular drum sound, create a thinner ring. If you’re not sure which to choose, start out with a thick o-ring: you can always cut more out later. Step 3: Once you’ve cut the center out of the old drumhead, there’s a good chance it won’t lay flat… The drumhead has been stretched from tuning and playing (see the picture, where this is most noticeable with the smaller circle cut out of the center). If you want to correct this, you can iron it with a LOW temperature iron (too hot and you’ll melt it!). To be extra cautious, place your o-ring between two thin towels. With a little heat, it should end up flat again. Step 4: Play it! You’re done, so jump on your kit and test it out. If you feel like your sound has changed too much, you can cut the ring thinner. Cut part of your old drumhead into long strips around 1/2 an inch wide and 8 to 10 inches long. These are great to use as snare wire straps: they are super strong, and will hold their shape over time. Fold a hard crease in the middle for where it folds through the snare wires. Keep some in your snare bag for emergency spare straps – don’t be left mid-gig without snare wires! 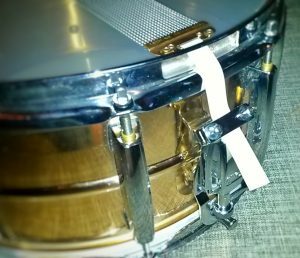 It’s important to mention that compared to using cord to tie on your snare wires, these tougher strips can make your snares slightly less responsive. This shouldn’t be a problem unless you’re doing extremely sensitive low-volume snare work. Tip: Make sure you put these snare wire straps on straight, otherwise you can end up with misaligned snare wires. Cutting the straps as straight as possible will help with accurate installation. Cutting a small strip out of an old drumhead can do wonders for snare wire buzz. A thinner strip of old drumhead (pictured) will cut the buzz a little. For more dramatic results, try a longer or thicker piece. This tip can be especially useful in the studio if you’re getting problematic buzz coming through the snare mics. Placement is important to control the buzz: closer to the center will mean less buzz, but also less snare wire response. Don’t overdo it, or you’ll end up with a snare sound that lacks the snap of the wires. 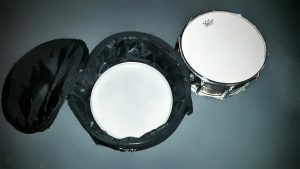 Tip: Using a thinner drumhead for this will allow you to retain some snare wire snap, while thicker heads will reduce snare wire buzz a lot more. Note: If you’re experiencing a lot of snare buzz, check your tuning first. If a tom is tuned to the same pitch as the batter or resonant snare drumhead, this will cause a LOT of buzz. Tip: Fold the edges out so it doesn’t fall off when you flick off your snare wires. Protect your bass drum batter head from the beater… This is especially important if you’re a heavy hitter or you’re using a hard beater (e.g. wood, plastic, hard felt). Using a patch comes down to personal preference if you’re playing with a light touch or with a softer beater. As well as the force of the impact, a hard beater can rub and heat up the head (especially if it doesn’t hit directly flat). If your bass drum has ever crept away from you at a gig, you’ll know that the beater can end up hitting at a strange angle. 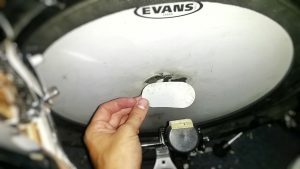 You can buy specially-made kick drum patches to put on your bass drum head, or you can make your own for free with an old drumhead. Cut a circle or oval out of the old drumhead; a good size is 2 or 3 times the diameter of the beater. Stick it on with any type of strong glue, and you’re good to go. Even if your old drumhead is completely beaten up, a spare head is better than no head in an emergency. Always carry a spare snare drum head to gigs, because it will be game over if your snare head breaks mid set. Keeping a spare drumhead for each of your other drums is also a good idea. Store them at the bottom of each drum case – you’ll probably forget they’re in there, until the day comes when you pop a drumhead. Bonus points if you carry a spare resonant snare head too. Putting an old drumhead between stacked drums is great to protect both the installed drumheads, and the drums themselves. 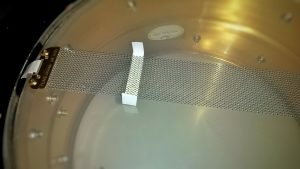 Snare wires can rub against things (especially during transport), so adding some extra protection can keep your wires straight and in top condition. If you’ve packed and stacked your kit, the metal hoops can put pressure on the kit’s drumheads. Put an old drumhead in between each drum to lessen the impact, which will save your new heads. First of all, Gig Pig = a crappy kit that you use for just gigging… Because who wants to scratch up their prized $5,000 shells on the road? This tip is great if you don’t have a lot of space in your car, and you’re willing to sacrifice a little drum tone. Some drummers will store drums inside one another for transport when touring in a small van (especially when the guitarist takes up all the space). Be aware this isn’t the best transportation method for drums, but is fine with a cheaper kit. 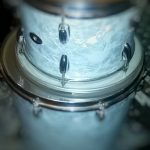 This tip also flies in the face of “good drum sound” best practice, but in the real world it can come down to actually being able to transport your kit versus getting a decent sound from it. Cut a big hole in an old floor tom drumhead, big enough to put your rack tom through. Now cut a big hole in an old bass drum head that will fit your floor tom. These two heads are now your resonant heads. When you need to pack up your kit, simply put your rack tom inside the floor tom, and then the floor tom inside the kick. Instant space saver! Obviously your drum sustain will go out the window, but if there are microphones on the whole kit this is less of an issue. So why not just remove the resonant heads completely? Because you want to protect the bearing edges – damage these and you’ll never be able to tune the drum right. Having an old drumhead on there will allow you to put the hoops on, keeping your bearing edges in top shape. Tip: A thicker drumhead will last longer if you’re planning on doing this. Old Drumhead Use # 9: Donate Them! Schools, churches, and charities can really appreciate some “new” drumheads. School drums are constantly being abused, and chances are your old heads will look and sound amazing compared to the beaten up ones on a school kit. If you know of any local churches, music charities, or other places with a communal drum kit, get in touch with them. If your heads are in okay condition and you really can’t find anyone to take them, see if the house kit at your local bar needs some love (you might even score a free beer out of it!). 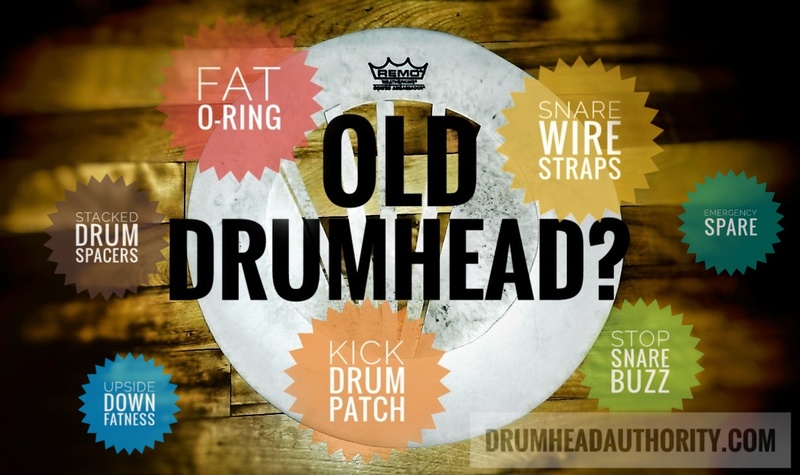 Use the web’s best drumhead comparison engine to find the perfect heads for your kit. Filter by sound, brand, coating, special features, and much more. Compare Aquarian vs. Evans vs. Remo drumheads, see detailed descriptions and line up all of the important info. Get the best drum sound possible out of your kit. Got any other tips? Get in touch!